The Rose bench is stylishly designed with a central rose design on the back of the bench, and latticework. The Rose bench is very popular with our customers and continues to be our best-selling bench many glowing reviews. The bench complements many other items of garden furniture we sell at Lazy Susan as well as being a beautiful stand-alone piece. The Rose bench is very lightweight at only 14kg which makes assembly and moving it around in your garden a far smoother task. Our Rose Cast Aluminium Garden Bench in White will turn any garden into an idyllic outdoor seating and dining area, perfect for entertaining guests. For a time-worn effect that remains strong throughout the ages, pop on over to the Rose in Antique Bronze, its charming sister in Slate Grey, or in summery Sandstone. Don't forget to look at our gifts section above where we offer amazing discounts of 30-70% on a wide range of products to complement your purchase of the Rose Bench. Very easy to order and excellent service and delivery. I would definitely recommend Lazy Susan to others! I love my white bench, it’s in situ under a pergola. Really pleased with the garden seat. Very easy to put together. Very happy with this purchase! 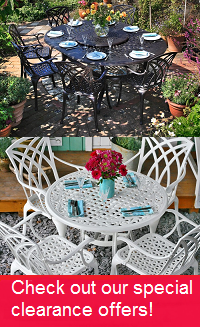 The Rose bench from Lazy Susan is very nice and looks really good in our English style garden. The curved back is very comfortable, we love to sit on it. It is suitable for 3 adults. Besides, it looks sturdy and resistant to bad weather. Very reactive to my questions. Fast delivery, even before the promised date. Item was in perfect condition, we'll see over the time but it seems very sturdy and more than correct. Thank you for being so professional. The bench and chairs are well made, well coated, screws made from stainless steel, comfortable when seated. Fast and easy process of ordering. Friendly contact on the phone and nice furniture. We hope that the furniture will last for years in our garden due to it being made out of coated aluminium. Delivery was quick and easy to order. The quality is excellent. Fantastic service, products long lasting hard wearing and lovely.